How To Buy LED or CFL Bulbs for Your Home – Green Is Better Inc.
As consumers are becoming more conscious of their energy usage and its effect on their wallet, they’re finding that one of the easiest ways to save money on their utility bills is by switching their incandescent bulbs to energy efficient CFLs or LED bulbs. 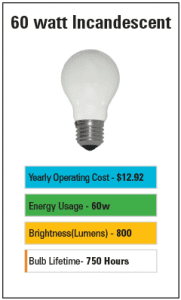 LEDs are more efficient than CFLs and their lifetime hours can be 2-10 times longer than CFLs, based on the model. In the long run you will save more with LEDs. We typically think of the brightness of a light bulb in wattage. However, wattage simply represents the amount of energy needed to use the bulb. The lumens scale indicates the brightness of a bulb and should be used when selecting your new LED or CFL bulbs. To save the most money on your electric bills, replace your bulbs with the lowest wattage for the desired lumens (brightness). We make it easy for you by listing the comparable incandescent wattage on every light bulb product page. What is Kelvin or The Kelvin Scale? Light color, or color temperature, is measured using the Kelvin scale. CFLs and LEDs are available in warm colors (low k) to match the yellowish light of incandescent bulbs, but you can also choose cooler colors (high k) with whiter or bluer light. Please see the color temperature chart below for further reference. The chart below will help guide you to the type of bulb you need depending on its specific application to ensure you select the proper bulb. Lighting your home or business comprises around 15% of your overall energy bills. On average, $200 is spent each year to light your home. These numbers may not seem like a lot, but consider this: you can cut that expense at least half with little cost and almost no effort on your part. By simply replacing incandescent light bulbs with CFLs or LEDs you can significantly lower your home’s energy costs. Want more savings? Install dimmers on your switches to make those new light bulbs last even longer and extend your savings. If you sometimes forget to turn off the lights, add motion sensors or timers to your indoor and outdoor lighting to make sure you’re only using energy and spending your money when and where you need it. Making a few simple, cost-effective changes to the lighting you already have can help you on your way to illuminating your life with savings. Ready to make the switch? 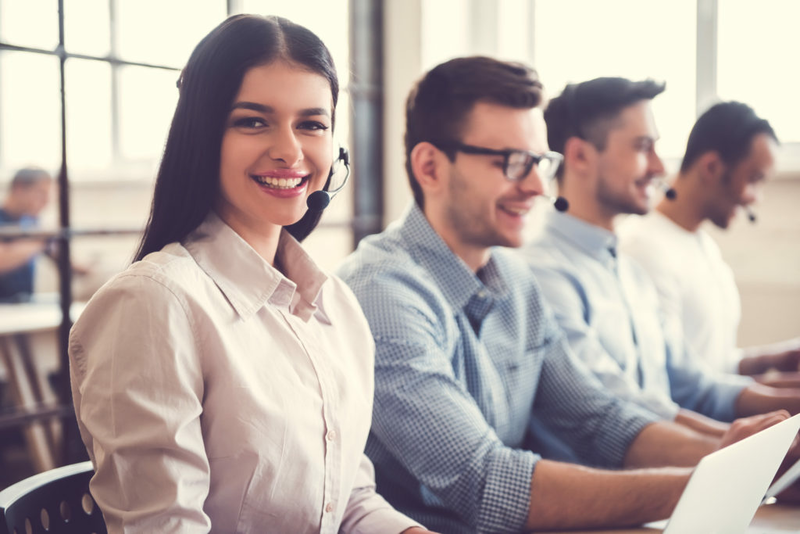 Green Is Better Inc. is here to help make it easy for you. The light bulb lumens chart / wattage chart below will help you understand which CFL or LED bulb is comparable to your current incandescent bulb. Simply take your current incandescent watts and select the corresponding CFL or LED bulb equivalent on the lumens brightness scale. Pay close attention to lumens, since this number indicates the brightness, or light output, of the bulb. To save the most energy, choose the bulb with the lowest wattage suitable for its usage. Light color, or color temperature, is described using the Kelvin scale(K). CFLs and LEDs are available in warm colors to match the yellowish light of incandescent bulbs, but you can also choose cooler colors with whiter or bluer light. A lower kelvin number mean the light appears more yellow; higher kelvin numbers mean the light is whiter or bluer. 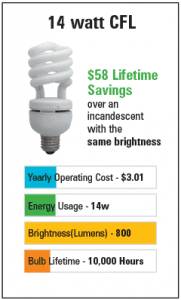 CFLs and LEDs are made to match the color of incandescent bulbs at 2700-3000K. If you prefer a whiter light, look for bulbs marked 3500-4100K. For bluer white light, look for bulbs marked 5000-6500K. Want to know more about your lighting choices before you make the switch? We have all the additional information on CFL and LED light bulbs you’ll need to determine what best fits your needs below. Semi Globe: Can be used in any fixture you would place a globe, these eliminate light waste by directing the light forward from the fixture. Capsule/A-shape: These maintain the same looks as incandescent bulbs and are often used in fixtures where the bulb is visible. Candle/Flame Tip: These are perfect for wall sconces, some ceiling fans and fixtures and covered outdoor fixtures where candle lights are desired. 3-Way: Just like incandescent 3-way bulbs, these can switch between 3 light levels, making them ideal for many table and floor lamps. Only use LEDs that are specifically designated for use in 3-way sockets for optimal savings. Dimmable: Made especially for use in dimmer switches for the most efficiency and savings. Avoid using non-dimmable LEDs with a dimmer switch, their lifespan will be reduced. Portable: These handy little lights are small enough to fit in your pocket but powerful enough to provide you with the light to need where you need it. Light-emitting diodes (LEDs) are a Solid-State Lighting technology, or an SSL. Instead of emitting light from a vacuum (as in an incandescent bulb) or a gas (as in a CFL), SSLs emit light from a piece of solid matter. In the case of a traditional LED, that piece of matter is a semiconductor. The movement of electrons through the semiconductor material illuminates the tiny light sources. The color of the light in the LED is determined by the energy gap of the semiconductor. A small amount of heat is released backwards into a heat sink; in a well-designed product, LEDs are basically cool to the touch. LEDs powerful enough for room lighting are more expensive than incandescent bulbs and CFLs; however, they offer many advantages including the lowest energy consumption of all light bulbs, longer lifetime, smaller size, faster switching, greater durability, reliability and do not need to be recycled. LEDs are an excellent choice for lighting your home or business. They provide the same quality of lighting that you’re already used to while using the least power of any light bulbs and helping to reduce greenhouse gas emissions. LEDs last up to 6 times longer than CFLs and 50 times longer than incandescent bulbs, reducing waste. 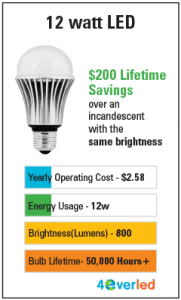 This means that making the switch to LED lighting can save you $200 or more in energy costs per bulb.